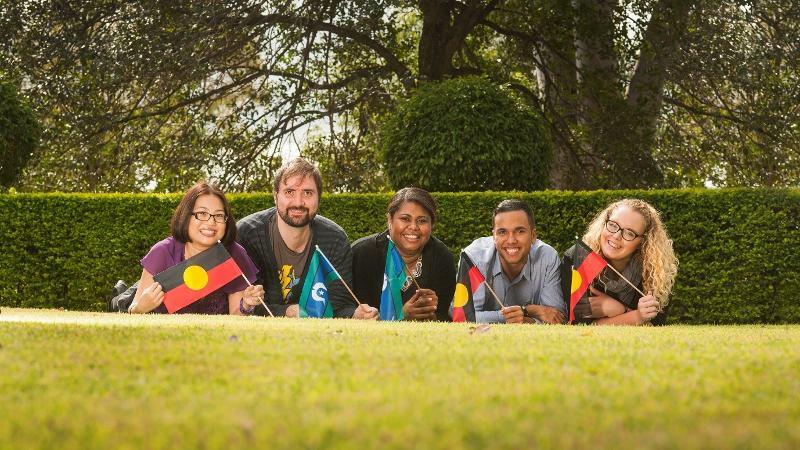 We will be celebrating Reconciliation at QUT with a series of activities from 26 May – 10 August. Join us to reflect on and celebrate Aboriginal and Torres Strait Islander history, culture, community and talent. The National Reconciliation Week (NRW) 2018 theme is Don’t keep history a mystery. We encourage all Australians to learn, share and grow through the exploration of Australia’s past. Show your support for reconciliation by attending an event, learning something new about Australia’s Aboriginal and Torres Strait Islander history, and encouraging those around you to do so as well. This year’s National Aboriginal and Islanders Day Observance Committee (NAIDOC) theme “Because Of Her, We Can!” celebrates the invaluable contributions that Aboriginal and Torres Strait Islander women have made – and continue to make – to our communities, our families, our rich history and our nation. Come and be a part of this free and all-inclusive event as we put Indigenous women to the front with a variety of traditional and contemporary performers, hands-on workshops, bushfood tasting and discussions. QUT Faculty of Law is bringing 'Storylines of Women, Law & Culture' to life, hear from an all- Indigenous female panel who have carved out their own paths and continue to campaign for change in the law and justice systems. Panellists include QUT Alumni: Magistrate Jacqui Payne, Cassie Lang, Stephanie Parkin and Allison Boland. 10.30-11.30am, Owen J. Wordsworth Room, Level 12, S Block, Gardens Point campus. Seats are limited, register your attendance here. The day will be a vibrant festival of Australia’s rich Aboriginal and Torres Strait Islander culture with traditional dances and dance workshops, basket weaving, bush food tasting and art workshops. 10am-2pm, A Block Lawn, Kelvin Grove Campus. Renowned textile and ceramics artist and 2018 Commonwealth Games medal designer Delvene Cockatoo-Collins will be doing a lino-cutting workshop across both campuses. The QUT Library brings you Paperbark: First Nation Narratives with Dr Anita Heiss. Join us for a morning with award winning Wiradjuri author, poet and social commentator Dr Anita Heiss – author of Growing up Aboriginal in Australia, Tiddas, and Am I Black Enough For You? 10:30am-11:45am, HiQ Activity Room, Level 1, QUT Library - R Block, Kelvin Grove campus. This event has sold out. To join the waiting list, email k.csatlos@qut.edu.au. 3pm-4pm; 4pm-5pm. Goodwill Bridge Lawn, Gardens Point Campus. These events are sold out, to join the waiting list email k.csatlos@qut.edu.au. Hear the hypnotic voices of Triple J National Indigenous Music Award winner, Thelma Plum. Supported by up and coming Brissy band Ancient Bloods, it’s free!! 7:30pm, QUT Botanic Bar, GP. Digital displays check out the Cube, HiQ screens, big TVs in the food courts and small screens around campus for Reconciliation at QUT content. During October the QUT Library and Precincts are hosting an Indigenous Literacy Foundation book sale fundraiser at QUT Gardens Theatre Foyer, GP. All are welcome and further details will be available in September.